LET’S FACE IT, most of us own an iPod these days, and we also spend an increasing amount of time stuck in front of our computers, so it’s comforting to know that there are companies out there who believe in making said digital devices sound as good as possible. One such company is Epoz, of Australia. Epoz was started in 2005, co-founded by Mike Creek, of Creek and Epos fame, to distribute the Creek and Epos brand, and in 2006 they began designing the first AktiMate product. Today there are three models in the range, consisting of the Mini, the Maxi, and the new Micro, which is reviewed here. Epoz say the AktiMate Micros are true hi-fi speakers with quality built-in amplification and can be the basis of a true hi-fi system. They say the inclusion of an iPod dock is an added feature rather than the main attraction. The AktiMate Micro review sample came in gloss red (black and white are also available) and look absolutely gorgeous. Measuring 145 x 200 x 240mm (W,H,D) they come supplied with a length of speaker cable terminated with banana plugs, power cable, USB cable, 3.5mm-3.5mm cable for MP3 players (or Airport Express) and some stick-on circular rubber pads for placing under the speakers. In the top of the active speaker, under a clever flip-up lid, is an iPod dock which accepts most iPods and iPhones – these will charge while connected. The active speaker contains a 40 watt (into 4 ohms) class D amplifier and a TI PCM2704 16 bit/48kHz DAC, for use with the USB input. The woofer is a 4-inch Kevlar driver and the magnetically shielded tweeters are 25mm soft dome, neodymium magnets. 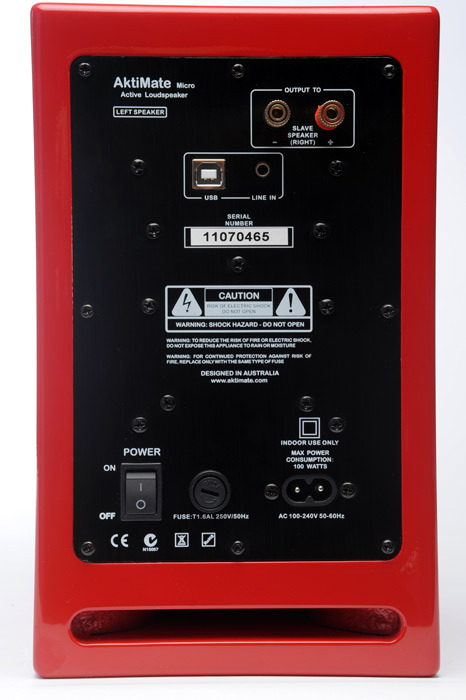 The three inputs can be connected at the same time, as there is an input selector on the front of the active speaker as well as a volume control; the on/off switch is located on the back. A universal power supply means you can use these anywhere in the world without needing to change the voltage. The Micros are rear-ported, so you’ll need to take that into consideration when placing the speakers. Setup couldn’t be easier – plug the speaker cables in from the active to the slave speaker, plug in the power cable, connect your desired sources (computers are plug-and-play) turn it on, a blue LED will light up. Go play some tunes. I connected the Micros up to my laptop in its usual residence on the desktop in my office space, which is actually a small alcove with an old Singer sewing machine table for a desk. Sitting at my desk and using Windows Media Player I brought up Salmonella Dub’s ‘Problem’ ripped from their CD Inside The Dubplates. Not knowing what to expect I had the volume at about 9 o’clock and when the opening bass-line kicked in, I gave a little yowl of surprise and quickly turned the volume down. The bass was quite astonishing and had a clear, thumping quality I hadn’t anticipated. Mids and highs were crisp and detailed and despite the position of the speakers being less than ideal, the overall sonic presentation was very impressive. Further listening showed the bass to be a tad dominant (in the sense that it overpowered the midrange a bit) but I put this down to my cramped work space and the difficult positioning – some experimentation alleviated the problem somewhat; I imagine most people will have a decent office space and I seriously doubt you’d be wishing for a subwoofer. Shuffling through my Media Library, iTunes and Foobar was thoroughly enjoyable and I was struck by how “audiophile” the little Micros sounded – there was a clear soundstage with proper imaging and a lifelike quality to the instruments. Tracks from Beirut’s The Rip Tide sounded lush and decisive with cymbals sounding better than the usual shh-shh sound I get through my Logitech 2.1 desktop speakers. Trumpets and horns soared above the mix, showing off the Micro’s excellent treble detail and vocals were clear and natural without sibilance. Impressed, I decided to try them out in a medium-sized (3.5 x 3m) room as a proper hi-fi setup. I realise the Micro model is aimed at the desktop market (the Mini and Maxi being aimed at the “first hi-fi system” and media streaming markets, respectively) but the sound quality just made me want to see what they could do. 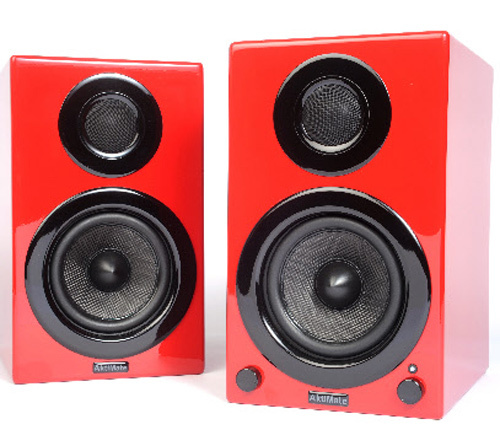 Placed on cabinets, blanket boxes and book cases they sounded great, enjoyable, completely tolerable; but taking care with placement I was rewarded with better definition through the midrange and more organised-sounding bass. Using a pair of heavy dedicated stands and after experimenting with positioning I sat back to enjoy some music, playing lossless files from my laptop and later my iPod Nano, plugged into the dock. Returning to the Salmonella Dub track, I noticed improvements all round. The bass, while not deeper (it didn’t shake the floor or rupture my bowels) was tight and punchy and better defined without seeming overwhelming, imaging was greatly improved and there was more detail within the nicely organised soundstage. The mid and upper midrange was lovely and clear and unfatiguing. I was impressed how the little speakers pushed the sound out into the room as, sitting about 3 metres away, I could hear sounds either side of my head. Listening to Nils Lofgren’s ‘Keith Don’t Go’ from Acoustic Live revealed a surprising richness and clarity; his guitar sounded remarkably lifelike and I could sense that he was actually on a stage performing to a crowd. That is to say, the way the sound of the strings resonated within the surroundings, rather than the noise of the crowd itself. The Micros seemed to take most genres of music in their stride, also playing rock and jazz with confidence and verve. From Kings of Leon and The Black Angels to Miles Davis and Dave Brubeck, they rendered an enjoyable aural picture with great sounding drums and cymbals. Speaking of rock music, I wouldn’t exactly call these party speakers; turning the volume up beyond normal listening levels with certain music made some of the Micro’s size restrictions apparent. But then you’d be a nonce to expect them to shatter your windows; they don’t need to be turned up too far to make quality sound. Another surprise came when listening to tracks from my iPod Nano (an old second or third generation model) – it sounded superb. According to the User’s Manual, the in-built DAC is accessible only via the USB input but I was seriously wondering if that was a misprint. The music came across solid and punchy without any of the thinness or treble harshness I normally associate with most portable MP3 devices. My only complaint is that there isn’t a remote to flick through tracks (snapping your fingers expectantly at your partner will not work, believe me) but I’m just being frivolous. The iPod dock is no mere after-thought; it is a worthwhile feature that brings iPod tunes to life with unexpected capability and it is nice to hear the little portable devices sound so good. The Micros obviously don’t have the same insightfulness or walk-into-the-studio transparency as a conventional hi-fi setup, nor do the speakers disappear entirely or present life-size images, but they are nevertheless incredibly involving and fun; like a small-scale version of a decent budget system. To be blunt I have heard $1k plus systems which sound like crap compared to these desk top beauties. As there is no need for a separate amplifier and outboard DAC, and due to their fairly insignificant footprint they would be ideal (apart from the obvious desk top situation, in which they truly excel) as stereo setups in small apartments, at the bach, in student bedrooms (any smallish room, really) and I think they offer incredible value for money. Take care with placement and you’ll be justly rewarded. 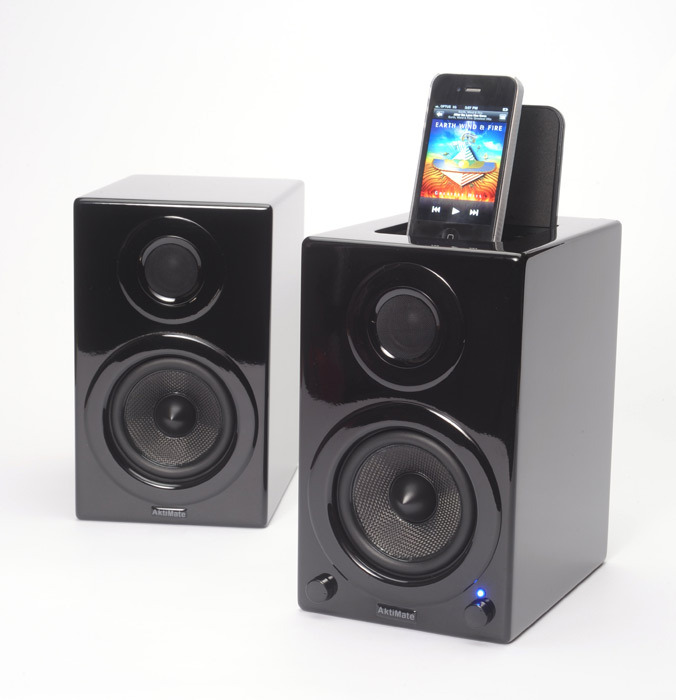 The other models have more features, such as RCA inputs for connection with CD players and televisions, and the Maxi has FM/internet radio and wireless streaming, but if you just want a basic desktop/iPod/PC speaker system, the Micro should be high on your list.